What are the benefits of cat teeth cleaning? 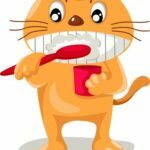 Do you brush your cat’s teeth? 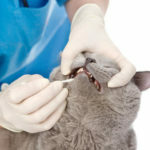 A poll at Catster.com shows that more than two-thirds of cat owners do not clean their cat’s teeth. But do you brush your own teeth? We know that most people do, and they don’t need a reason. Yet when we tell our clients they should clean their cat’s teeth, we usually get a big-eyed expression and this response: “What? 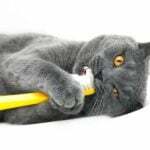 Are you kidding?” In this article you are going to learn why it is important to clean your cat’s teeth. Cats are mammals, we are mammals. We may have a different form, different functions, and a different amount of teeth, but generally their teeth are built the same way, they grow very similarly, and they decay and fall out very similarly. So if there are reasons to clean teeth for humans, there also must be reasons for animals, like cats and dogs. Cat teeth cleaning prevents teeth from decaying and falling out. Without teeth, life would not be as much fun, right? House cats can survive without teeth, but in the wild, losing teeth means becoming disabled and reduces survival chances significantly. Also, in cases of missing and painful teeth, your cat may digest his food inadequately, which may lead to improper nourishment, linked to list of possible consequences. Cat teeth cleaning prevents gum diseases, such as periodontitis, which is inflammation of gum tissues. Gum disease may cause irritation and pain in the mouth, and can spread the inflammation to other parts of the body.Gum disease is the most common cause of bad breath in cats. Cat teeth cleaning improves overall health by reducing bacteria growth in the mouth and its spread to various organs. In human medicine (and there should be no differences with veterinary medicine), links between oral health and certain diseases, including cardiovascular disease, have been confirmed. If we were writing this list for humans, it would be almost the same. Expect that it would list “maintain bright smile” in the number one spot, because many of us think that’s important. Cats don’t give a damn about their smile, but the above arguments for cleaning your cat’s teeth are sometimes not enough, and we need to answer some more questions before seeing the whole picture. Cats don’t clean their teeth in the wild. Why should we brush their teeth at home? That first part is true. If we understand that cleaning teeth means using a brush and a paste, cats don’t do that in the wild. But hey, humans don’t clean their teeth in the wild either. Besides, in the natural environment cats eat a whole lot of different foods. Killing prey, tearing its skin and flesh, crunching bones: this all serves as teeth cleaning. But is it good? No, it’s not. The mouth of a wild or feral cat is not even close to being ideal in terms of healthy teeth and gums. For example, a study of 301 feral cats on Marion Island (which is uninhabited) found moderate or advanced periodontitis in 61.8 percent of cats. 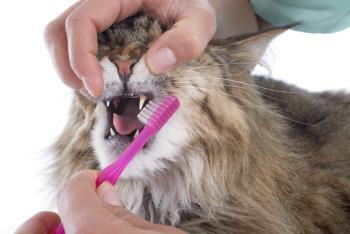 Yes, cats don’t brush their teeth in the wild, but their dental health is awful. Good news for them: they don’t need it. Wild cats don’t live to a peaceful senior age, because the harsh rules of the wild dictate that when you become weak, you go over the rainbow bridge. Unlike house cats, wild cats don’t need their teeth to last for 20-plus years. Is it enough to use dry food to clean your cat’s teeth? Another question often asked is about dry food. It’s constantly claimed that dry food is the best cat food (it’s balanced and whatnot) and also cleans your cat’s teeth. Studies show that dry food can decrease risk of periodontal disease in dogs and cats, but it cannot replace regular brushing and veterinary checkups. First, dry food leads to only crunching in the mouth, which is nothing compared with the mandibular action involved in eating live prey. Second, dry foods make saliva very thick and incapable of serving one of its purposes–cleaning teeth. Third, dry food is not even close to being the healthiest food for your cat. Meanwhile, you can think about just one thing: the only argument against cat teeth cleaning is that you don’t care about your cat’s dental health. Yes, it’s not a crime to view a cat as “just a cat.” That’s your decision. But if your cat is a member of your family, and you are willing to provide him the same level of health care that you have for yourself and your kids, you need to clean your cat’s teeth every day, or at least, three times per week. Click here for our next article to find out why less frequent cat tooth cleaning is not only useless, but may be even worse than not caring at all. 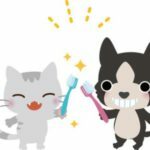 This article is a part of series about cat tooth brushing.